Riggio Distribution offers retail services, such as customized packing, sales planning, and merchandizing assistance. Our team is ready to help increase your sales! 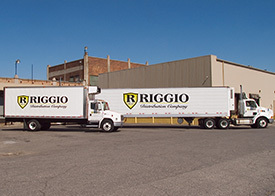 Riggio Distribution employs a fleet of refrigerated trucks ready and available to deliver all of your produce needs. We offer warehouse to warehouse as well as direct store delivery (DSD) to both corporate and independent accounts.